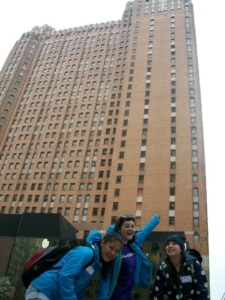 The students were in the midst of a spring break trip to Detroit. 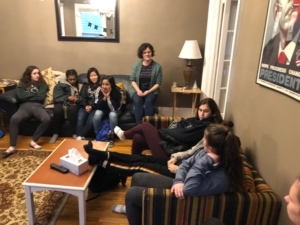 Their trip is designed as an opportunity for kids in Ann Arbor, many of whom have never been to the city before, to engage with the city. Students go to cultural institutions, meet with community leaders and engage in some low impact service– it’s a chance to dip your toe in the water, to get a basic sense of the landscape, and to challenge the simplistic narratives that many non-city kids hear about Detroit growing up. As a high schooler, I went on this trip twice, in my sophomore and junior year. For me, the trips were really the first times I had been in the city in a meaningful way. Those two spring break trips served as a catalyst for my life in this city– my Detroit timeline begins with the week I spent in the city as a 14 year old. In college, I ended up working for the nonprofit that hosted us on that first trip– the bedroom that I camped in with 13 other giggly high school girls in 2012 became my first adult bedroom. I went on to build a professional and social network here, and now, here I am, living, working and playing here as an adult. 15 year old me in front of the Guardian Building– I now work on the 15th floor! Sitting in my living room with the students eating hamburgers, I felt old and young all at once. It didn’t feel that long ago that I was seeing this beautiful city for the first time, and at the same time, it was a chance for me to reflect on how far I’ve come here, on the deep friendships I’ve made, the learning I’ve done and the professional goals I’ve accomplished and set for myself. There’s so much more for me to learn, and I’ll never see it all, but I’m so grateful to be here!